With the arrival of Java EE 7 and the requirement to handle advanced features such as the Web Sockets API and HTTP upgrades (e.g. EJB over HTTP), an important decision has been made by the WildFly development team. After a long commitment to JBoss Web Server (a fork of Apache Tomcat), the new release of the application server is now based on a new Web server named Undertow. Undertow is a flexible, fast, Web server written in Java that is based on the J2SE New Input Output (NIO) API. 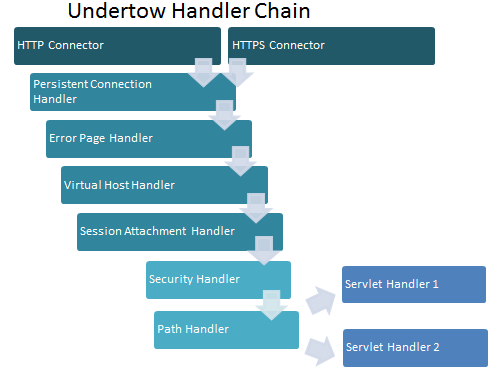 Undertow is designed around a composition based architecture that allows you to build a fully functional Web server by combining small single components called handlers. These handlers are chained together to form either a fully functional Java EE servlet 3.1 container or a simpler HTTP Process handler embedded in your code. Undertow Web server also the flexibility to choose between the non-blocking asynchronous handlers to handle tasks, or delegate requests to a blocking handler, backed by a Thread Pool. One key elements of the Undertow configuration are Buffer Caches. A Buffer is essentially a block of memory into which you can write data, which you can then later read again. This memory block is wrapped in a NIO Buffer object, which provides a set of methods that makes it easier to work with the memory block. The obvious advantage of using a Buffer is that memory access is much faster than physical access. 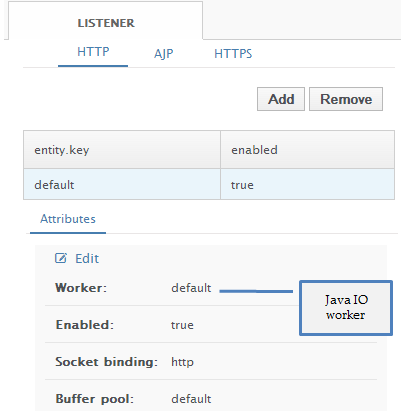 Besides Java NIO, WildFly makes a large use of XNIO (http://www.jboss.org/xnio) which is a low-level I/O layer which can be used anywhere to simplify the usage of NIO API. It solves out some of the complexities of using Selectors and the lack of NIO support for multicast sockets and non-socket I/O such as serial ports, while still maintaining all the capabilities present in NIO. Undertow Core: Used to associate Handlers and Filters to the HTTP Connection. The first parameter, the Stack size corresponds to the Web server Thread stack size. With a larger Thread stack size, the Web server will consume more resources, and thus fewer users can be supported. The Task keepalive (default 60) controls the number of seconds to wait for the next request from the same client on the same connection. With Keep-Alives the browser gets to eliminate a full round trip for every request after the first, usually cutting full page load times in half. The number of Io threads corresponds to the number of Web server Threads available. This is an important tuning parameter which needs to be increased for Web applications which experience a high traffic. The Task Max Threads has control on the max number of concurrent requests. 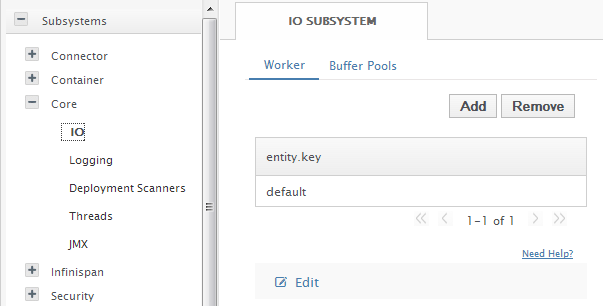 Click Save when you are fine with your IO Worker configuration. Click on the “default” element contained in the table and check that the Worker element is associated with your IO Worker. The worker needs to be enabled as well in order to be usable. Next, we need to associate the HTTP listener with a Socket binding (see from the General Configuration left menu the option Socket Binding to check the available socket bindings for your configuration). Finally, an HTTP server is also bound to a Java NIO Buffer Pool implementation which is discussed in the next section. java.nio.ByteBuffer whenever buffering is needed. A Buffer is an object, which holds some data, that is to be written to or that has just been read from. 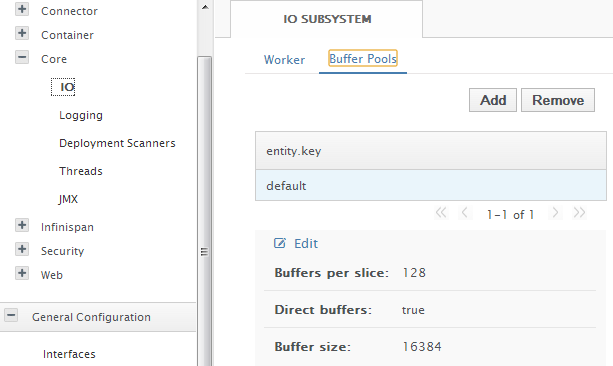 The addition of the Buffer object in NIO marks one of the most significant differences between the new library and original I/O. In stream-oriented I/O you used to write data directly to, and read data directly from, Stream objects. In the NIO library, all data is handled with Buffers. When data is read, it is read directly into a buffer. When data is written, it is written into a buffer. Anytime you access data in NIO, you are pulling it out of the Buffer. Buffers per slice This parameter defines how many buffers per slice are assigned. Slices are used for manipulating sub-portions of large buffers, avoiding the overhead of processing the entire buffer. 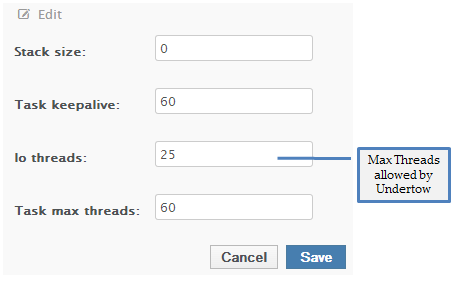 Buffer size This option let you define the java.nio.ByteBuffer size. Provided that direct buffers are being used, the default 16kb buffers are optimal if maximum performance is required (as this corresponds to the default socket buffer size on Linux). 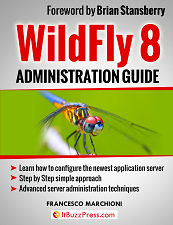 This excerpt has been taken from the “Wildfly 8 Book” which is a practical, easy to understand guide that discusses the most popular open source Java application server: JBoss Wildfily (renamed from JBoss AS). This book covers all details on administration and management aspect of this new exciting version of the application server. Focusing exclusively on the management instruments of the application server, the book takes you through all of the latest architectural and performance changes. You’ll progress from basic server configuration to more advanced techniques for clustering, JDBC connectivity, logging, and much more. Nice Article. Could you please provide the steps how to configure the following valve (now undertow) in wildFly 8 ( http://jamonapi.sourceforge.net/http_monitoring.html) or any other reference for to configure in wildFly8? There they have given only for jboss 4, now I need to do those configuration in wildFly 8. JBoss 4.0.5/4.2 – Other versions may work too. Put jamon-2.7.jar (or higher) in the jboss instance ‘lib’ directory (ex. default/lib). Put jamon.war (or higher) in the jboss instance ‘deploy’ directory. (ex. default/deploy). Add the following Valve line to Tomcat’s server.xml file (i.e. jbossweb-tomcat55.sar/server.xml). The ‘Engine’ line is used to show context. Hi Kishore were you able to configure the Valve you intended to so far ? > Undertow is a flexible, fast, Web server written in Java that is based on the J2SE New Input Output (NIO) API. “J2SE”? What is this, 2004? “New Input Output”? You mean Non-blocking Input/Output? > The obvious advantage of using a Buffer is that memory access is much faster than physical access.